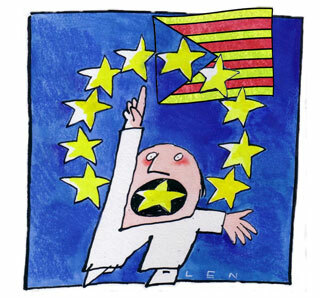 The European Commission’s vice president said Spain’s wealthy region of Catalonia would have to leave the European Union if it declared independence, remarks that disappointed many in the growing Catalan secessionist movement. “If one part of a territory of a member state decides to separate, the separated part isn’t a member of the European Union,” Joaquín Almunia said on Monday during a conference in Barcelona, in one of the strongest statements on the issue by a leader of the EU’s administrative body. His comments highlighted a major hurdle for Catalan independence activists—gaining international support at a time when European officials are loath to take on any new issue that might further destabilize the region’s crisis-racked economies. The comments are broadly in line with remarks made last year by European Commission President José Manuel Barroso about Scotland having to reapply for membership if its planned referendum on independence from England passes. Economists say the mere talk of secession by Catalonia, an industrial region long known as “factory of Spain,” undermines investor confidence in Spain, which is struggling to pull out of a double-dip recession. Catalan secessionists, whose ranks have swollen during the recession, say their region has long suffered economic and cultural discrimination by the rest of Spain. Their movement is marked by a strong pro-Europe sentiment; many say they would like to see an independent Catalonia inside the EU.